We are all familiar with traditional, plain gold or platinum wedding bands that often accompany a show stopping engagement ring. However, it is just as important to have a unique wedding ring that not only symbolises the wearers’ story, style and preference, but allows your engagement and wedding rings to complement one another and your big day perfectly. For lovers of the great outdoors, an organic wedding ring would be a suitable choice for a wedding ceremony set amongst nature’s beauty. With hand engraved details and a brushed finish, the ring will show the level of intricacy and delicacy that can be achieved by creating a bespoke ring. A ring like this one ensures an entirely unique and individual representation of your love. For vintage lovers, there are a variety of ring styles and elements that can give your wedding ring an antique feel. Engraving and milgrain would be the perfect match for an existing vintage inspired engagement. Consider milgrain detailing around the band to match an art deco engagement ring, or beautiful artistic filigree for an antique finish. Scalloped diamond wedding rings also give a vintage twist on traditional wedding bands and can be designed to sit perfectly flush with an existing bespoke engagement ring. A vintage ring is quintessential for those who love the timeless styles of years gone by. Instead of the traditional diamond wedding ring, why not go with a gemstone instead? Gemstones are a colourful and personal alternative to diamonds and can be used to symbolise anything from a favourite colour, a birthstone or even a place or moment. For instance, if you and your loved one went to the beach on your first date, consider having a blue sapphire or an aquamarine in your wedding ring to represent the ocean; an eternal reminder of a place that means something to you as a couple. There are endless possibilities when using gemstones in wedding rings and at Rare Pink we can bring your design ideas to life. 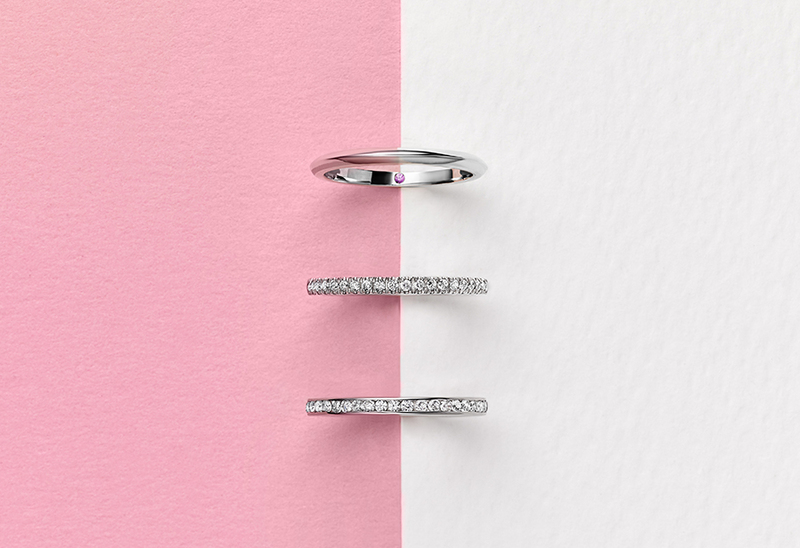 Dependent on the design of your existing bespoke engagement ring, the accompanying wedding ring can be crafted so that it hugs the edges of the diamond, making the rings sit perfectly flush with one another. Creating a bespoke wedding ring with Rare Pink ensures you will both be presented with items of such elegance and personal resonance to be enjoyed and admired for years to come. If you have any questions or want to share your design ideas, feel free to speak to an expert. If you are looking for a more traditional wedding ring, look no further & enter our competition here to win the ultimate engagement prize in partnership with Hand Picked Hotels.